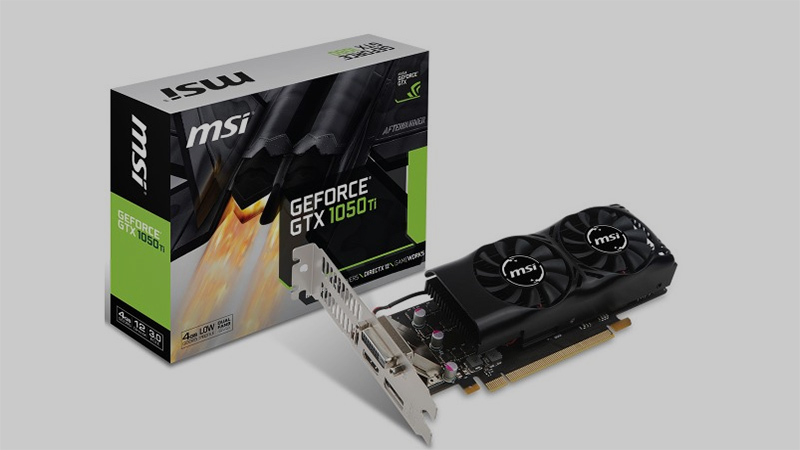 MSI has unveiled new low-profile GeForce GTX 1050 and GTX 1050 Ti graphics cards designed as compact upgrades to turn your rig into a powerful gaming PC at a low cost. The GTX 1050 Ti 4GB LP will feature Nvidia’s reference GTX 1050 Ti clock speeds of 1,290MHz base and 1,392MHz boost, with memory speeds of 7,000MHz. It also boasts 4GB of GDDR5 memory, making it suitable for modern games at 1080p with high-resolution textures. The MSI GeForce GTX 1050 2GT LP features Boost and Base Clock speeds of 1,455MHz and 1,354MHz respectively, with 2GB of GDDR5 VRAM. Finally, both cards only require a maximum of 75W from your PSU, making them perfect to slip into an old desktop or media PC build, as they does not require any PCIe power connectors. No pricing or release date has been confirmed for the cards as of yet.